The Torah has already stated (in last week’s Torah portion) that Rivkah was the daughter of Besuail, the sister of Lavan, and was from Padan Arom. What do we learn from this seemingly superfluous information? Many people try to excuse their faults by blaming others as the cause of their behavior. “It’s not my fault I have this bad trait, I learned it from my father and mother.” “I’m not to blame for this bad habit since all my brothers and sisters do it also.” “Everyone in my neighborhood does this or does not do that, so how could I be any different?” They use this as a rationalization for failing to make an effort to improve. I’ve had the displeasure of reading two very vitriolic and venomous blog posts written by a single individual (with comments, some of which were equally virulent) this week (no, not in my “morning meditations,” fortunately). I have to remind myself that online attack dogs are often really victims in a real or perceived sense (even if you misinterpret what is going on around you as “victimizing,” the emotional distress is still the same). In this week’s Torah portion, we see some rather disturbing behavior by Isaac, his wife Rebecca, their son Jacob, and particularly Esau. Esau thinks so little of his birthright that he sells it to the rather clever Jacob for the price of a meal (it’s unlikely Esau was literally starving on that occasion). Both Isaac and Rebecca play favorites among their children, though Rebecca has some “inside information” about Jacob from God to guide her reasoning. And his two apparent acts of deception force Jacob to abruptly leave home and seek out the relative safety of the ancestral home of Paddan-aram and the house of Beuthuel. Isaac is the son of Abraham, who walked with God, and yet he and his family, who should have known better, would be called “dysfunctional” in our day and age. But what does the Dvar Torah say of Rebecca (Rivkah)? She was raised in an environment of evil and you would expect that she’d emulate her family, including her father Laban. Here we see that pointing the finger at others, even if the others are “worse” than you (or you only believe them to be worse) is no excuse for what you do or fail to do. Yes, it takes courage to walk the moral high road, to show compassion rather than negativity, to offer friendship rather than rejection, but how often is this kind of courage displayed by those people in the Bible who were closest to God? Although Sodom was unspeakably evil, Abraham pleaded with God to spare the city if it contained just ten righteous people (Genesis 18:16-33). After the sin of the Golden Calf, God was intent on destroying the Children of Israel and ready to start over by making a great nation of Moses, but Moses begged God to relent (Exodus 32:11-14). Even the Master, suffering on the cross, spoke no curses against those who were killing him but instead said, “Father, forgive them; for they do not know what they are doing,” (Luke 23:34). Even if someone wrongs you, even if someone disappoints you, even if someone you trusted seems to have betrayed you, how you react to them tells the world more about you than any flaw another person may have or display (whether that flaw is real of just imagined by you). There’s no excuse for playing the victim card in order to express hostility, maliciousness, malevolence, spitefulness, viciousness, vindictiveness, or any other harsh or savage behavior or speech (and “speech” includes what you post in the blogosphere, in discussion forums, and on websites). As a disciple of the Master, you have a responsibility to represent him in this world. So do I. So do all of us. We can either exalt or denigrate his name by our behavior. Provocation is no excuse. Any sense of victimization by others (real or imagined) is no excuse. Rachel didn’t use that excuse. Abraham prayed for Sodom. Moses pleaded for the Children of Israel. Our Master asked that the Father forgive his executioners. Be careful of the words you say. Keep them soft and sweet, because you never know, from day to day, which ones you’ll have to eat. We have a foster child right now that is rather manipulative. I have spoken to my children a lot about boundaries. Just recently we have started talking about not being a victim of the other child’s behavior. She is here for a short term placement while her parents work on learning ways to parent her differently (she is the only child that is not in the home as she was raging there). We are not going to change her. She is going to manipulate, seek revenge and lie. We need to decide how we react and react in a way that demonstrates love… because no matter what WE belong to our Creator. As a foster parent, you probably know that children have limited options in reacting to their environment, so “acting out” is sometimes the only way they can express what can’t be articulated in a more mature manner. My “target” for today’s “morning meditation” are adults who can’t see past their issues and as a result, do not show appropriate respect or compassion for others. When we grow up, we’re expected to mature, not only intellectually, but emotionally and spiritually. If our pain, past or present, real or imagine, prevents us from showing love for someone else in pain, then we are letting our experiences and circumstances control us. Often children have few choices in a difficult situation, but adults can grow past all that, especially if we’re in the will of God. Thanks for visiting and commenting, Julie. FYI. I’m with my grandson for the day, so comments might not be approved in a timely manner. I’ll be back in the late afternoon to look, but Shabbat comes fast in these parts, so I might not have time to respond to approved comments. Blessings and Good Shabbos. I haven’t finished my parsha studies for Toldot, but have been reading the part about Avimelech’s Philistines backfilling the wells that Yitzchak inherited from his father, who had dug them. And there are those who do this. 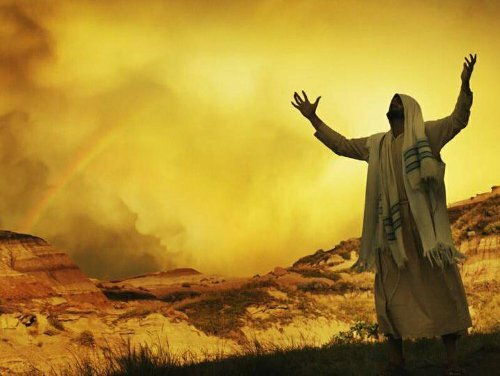 Many Jewish sages seem to be fixed upon portraying the biblical characters as extraordinary in character and holiness, when they were people just like us who had a God-encounter, and either decided to listen to the heavenly voice or not. I don’t see anywhere that Rivkah was especially holy; we all know about those idols under the saddle, and yes, I am aware of commentators that claim this was to take them from her father to keep him from idolatry, but I think differently. Yes, her father was a conniving character, but I don’t see that Leah was wicked; only that she sought to deal with a difficult situation in the best way she could. Since you appear to be speaking vaguely, there is no way I can make a decision about whether someone is speaking vitrolic or not. And I am well aware of the practice of deflecting questions and critiques by claiming that your opponent must be in bitterness and reacting out of personal hurt. We are told to bring everything to the light. Only those who do deeds of darkness are afraid of the light. It is clear that we are to not participate in the unfruitful works of darkness, but expose them. No, we are not responsible for the deeds of darkness committed by others, but if we join in the cover-up, then we are also responsible. This occurs even in the secular world of criminal justice, where someone, not matter how well-meaning, tampers with evidence to cover up a crime is also guilty. Shavua Tov, chaya — This is just a quick note to correct a minor confusion on your part. Rivkah was not the one who hid idols in her saddlebags, for any reason. That was her niece Rachel’s trick in next week’s parashah “Vayetzeh”. Parashat “Toledot” ends just before Yakov heads out toward his Uncle Laban in Padan-Aram. Your little slip doesn’t detract from your point, but I thought you might appreciate a refresher on the facts. On a more general note, backfilling unused wells was a common means to preserve the scarce water resources that would otherwise evaporate into the desert air. However, one might well ask the question about just how the Philistines could have been so sure that these wells that Avraham’s herdsmen had originated were truly unused by his son Yitzhak’s herdsmen, such that they could feel justified in filling them in so that it became necessary to for Yitzhak’s herdsmen to take extra effort to re-open them. It does, of course, carry implications regarding the ownership of the land according to the standards of the day, not unlike how ownership was determined in the “Palestine province” under the Ottoman Turks, by whether the land was actively under cultivation. Backfilling wells, therefore, was also a way to “erase” the signs of Jewish presence in the land. Comparable techniques are still in use by the modern Arabs who claim affiliation with those ancient Philistines, who deny the historic Jewish connection with the land of Israel and use construction techniques that deliberately destroy archeological artifacts and the integrity of their placement lest further proof should surface to demonstrate that Israel is Jewish land (particularly on and around the Temple Mount). However, some vigilant souls do manage to rescue Jewish artifacts nonetheless, even if the information that could have been derived from their original location is lost. @Julie: I have a great amount of admiration and respect for foster parents. I was a social worker in Child Protective Services for a number of years, so I know something about the challenges foster parents face. Also, my brother-in-law and his wife adopted four sisters (same birth mother, but not all had the same birth fathers) who came from a very difficult circumstances. The girls are all young adults now and doing pretty well, but they also faced many hurtles with the girls as they were growing up. I agree that the process of parenting and foster parenting causes each of us to face our own inner difficulties and to overcome them, not becoming perfect, as you say, but better. Yes, I call that the Rabbinization of Abraham. No, Rivkah wasn’t especially holy and in fact, she had her faults just like anyone else, but the midrash on the various people in the Torah act as parables to teach us important moral lessons. That’s what I was trying to do today. Since you appear to be speaking vaguely, there is no way I can make a decision about whether someone is speaking vitrolic or not. Yes, I was deliberately vague, because I felt that it was more important to communicate a principle of behavior we should be upholding as disciples rather than calling out people and naming names. Doing the latter would just end up in a “war of words” with resultant angry and hurt language, which makes the problem worse, rather than enables repair. Also, there are innocent parties involved that I don’t want to drag down as well. However, being human beings, we all have a side to ourselves that tends to justify our behavior when we treat others poorly. The question each of us has to ask ourselves is whether or not our sense of hurt justifies hurting anyone else, particularly in the eyes of God who judges all. @Julie: I really loved to hear that you use boundaries in your family. I read a book and took a class for many weeks on that over 10 years ago. I had no idea how much that book/class would affect me later. I think I need to be kinder about how I enforce my boundaries, like you said you have worked on as well. I always thought it was just the right thing to do to enforce them and I didn’t consider the way I might be coming across sometimes. Thank you for the encouragement. Thank you for fostering also! Sorry for the senior moment; I was reading Rivkah and thinking Rachel. Rivkah had a wicked brother, but it seems her father was just weak and allowed Laban the control. Interesting info re: well and land ownership.